How about a funeral parlor? deadpanned the older gentleman to my right in Spanish. You shouldn’t have to go so far to die. Touching my arm, she continued, And a sweets shop… before finally collapsing in giggles. Yes, of course, I said, laughing, because if you’re going to die, you might as well have enjoyed yourself. We were at a design charrette run by the East L.A. Community Corporation (ELACC). They had put the event together to inform Boyle Heights residents in need of affordable housing about their plans to convert an existing 7-unit structure at 1st and Soto to one that would hold about 50 units. After the facilitators spoke about their affordable housing projects, selection criteria, and other logistical information, they broke the attendees up into 3 groups of 8-10 people. Each facilitator then led the group through an ice-breaker and a discussion of the kinds of amenities people might enhance the new, transit-oriented site. ELACC had already planned for the basics — now, they wanted to know more about the specific kinds of things people might like to grow in the (proposed) 4000 sq. ft. garden, activities or facilities that would be part of the community space, or businesses that could fill the commercial spaces below the apartments. The suggestion of a “funeraria” came up as a potential business, I guessed, because of the gentleman’s earlier observation that most of the attendees at the event were well above the age of 50. I wonder if it is only older people that need assistance with housing, he had said to me, looking around the room. You don’t see too many young people here. Having been a volunteer on and off at Roosevelt High in Boyle Heights over the past few years, I knew that that was not the case. Many of the students I knew spoke openly about having to move from place to place because of economic problems or of having to get jobs to supplement their family’s income. One girl (a straight-A student, by the way) I worked with said she often did her homework in the bathtub because, in a two-bedroom apartment where 11 people lived, there were no other quiet spaces available. But I really didn’t know why families like theirs weren’t present. Maybe they just don’t know about these kinds of opportunities, I had speculated, after telling him about the people I knew. Many don’t have access to the internet, so they can’t look them up. Or, they either think they won’t be able to get the help they need or are too overwhelmed to be able to get to such a meeting? Hmm, he pondered this. That is a possibility. Many of the attendees present had been informed about the opportunity through their involvement with ELACC’s community organizing program. Others were tenants currently inhabiting the space that would eventually be replaced with the new structure. 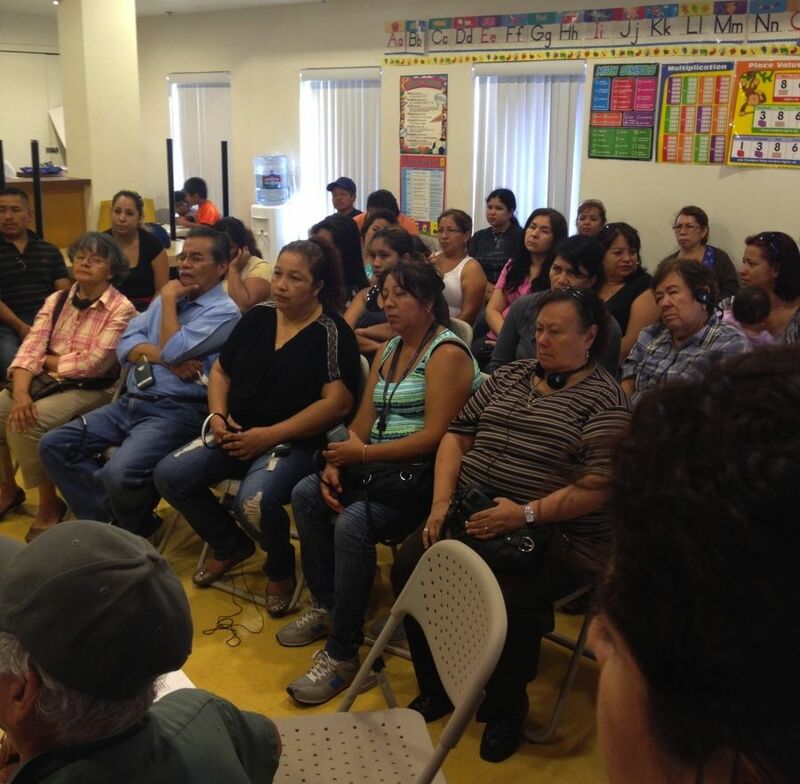 Unfortunately, it was probably almost just as well that everyone in the community hadn’t known about the event, I thought, after hearing that the waiting lists for some of ELACC’s existing buildings can already run anywhere from 6 months to 2 years. For a family with children that is really struggling, waiting in limbo for help can make months feel like years. And the more families that were made aware of the opportunity, the longer the wait list would be. That sobering reality aside, the workshop was actually lots of fun and a great way for me both to hear about what kinds of things people envisioned for their community and to see how residents’ needs or aspirations compared to those of South L.A. (my regular beat for the past 1 1/2 years). Because it is a predominantly Latino community, most of their suggestions celebrated that heritage, cultural preferences (i.e. crops for the garden), and specific needs (like English classes). But, like people everywhere, I would imagine, they also wanted things that would help them lead more active and healthier lives, such as an exercise room (So we don’t get obese! said a woman in her 60s), a computer room and basic instruction, a child care center, a movie night, a pool, and an art space. When we got into a discussion about the possibility of using the crops produced from the garden as a source of income, people began coming up with all kinds of ideas for interesting income-generating activities. A cooperative store where the produce could be sold, the older gentleman said, suggesting it could take up one of the commercial spaces in the building. A handicrafts workshop, suggested another woman, thinking that sewing, jewelry-making, and other classes in the community space could result in products that could be sold. Organizer Rey Fukuda diligently copied down everything onto several posters, finally turning to the group and asking if everyone was on board with all of the suggestions they had heard. Minus the funeral home, said a man in his 30s, with a laugh. That’s not necessary. Affordable housing projects are important to a certain extent, but what his article describe is just craziness, like residents thinking they get to pick which business will operate in the complex. On a free country and a free economy, whomever pays more gets to open the stores there. And this is how things should be. Participants were specifically asked by the facilitators to think about what kinds of businesses they might like to see in the complex. Participants were not being crazy. Funny, yes, very much so. But crazy, no. ELACC will be operating the property and while they told participants they cannot and will not determine the brands of the shops that would open there (i.e. bringing in Subway if the residents would like a sandwich shop) or even mandate what kinds of shops they would be, they were asking residents about the kinds of things they might like to see or shops they would be most likely to frequent. It isn’t a ridiculous approach, as you seem to think. Any business owner with even just one iota of competency who was considering moving into a site would want to know the extent to which there would be a market for their product, no? The organizers’ gathering of information ahead of time facilitates the process of attracting businesses into the area and making sure that everyone — business owners included — benefit from their presence. There’s nothing in that kind of information-gathering/research approach that thwarts the free economy that I am aware of. SOCIALISM! I have no clue what the word means or how it applies here, but surely asking prople what they want must be SOCIALISM! The people don’t own the businesses so they must be SOCIALISTS! FYI, Andrelot: This “whoever pays more gets to open stores” line of thought isn’t even how things are always run even in the private sector. The giant mall corporations in this country are ruthless in their control over which businesses can come in, which spaces they will occupy, and how they can use their space. They have it down to a science in order to maximize the profit of the overall enterprise. McDonalds can bid high if it wants, but if a mall wants to maintain a classier feel (and attract a more profitable flagship department store), then the mall can give the space to Chipotle or the Counter at a lower price. If anything, since we are talking here about where people live rather than where they shop, affordable housing residents should have more say in who gets to open stores in their complex. Big difference is that malls or outlet shopping complexes are private property, they are built by developers and managed by commercial R.E. companies. An affordable housing complex built with public funds is RESIDENTIAL first place, and any commercial activity should have the goal to maximize the commercial rental income to reduce public expenses on housing. What site at 1st and Soto is ELACC proposing building this complex? From what I see there are only 2 existing structures at the intersection fitting the description. One is a late 1800’s Victorian with decorative wood sididng and intact stained glass windows on first street just east of Soto and the other is a Square stucco complex just south on Soto. Can you please clarify Sahra? Good question. For whatever reason, I haven’t been able to get an answer yet. I’ll let you know as soon as they tell me. Andre, you still haven’t answered the question of how shops that people want in their area and plan to frequent is somehow bad for business and bad for the economy. And, for the record, the building is not going to be public housing. Its construction will be funded with grants, but its operation and maintenance will be handled by ELACC, an organization that happens to get its resources from a number of private donors. Declared preferences (what people say they want) vs. revealed preferences (what/where people actually shop, e.g., what is revealed by their consumption trends). There are many situations where there is large divergence about stated preferences and revealed preferences. in size, from one-bedroom to three-beds. So then the answer is yes, ELACC is planning on demolishing the property at 2415 e. 1st st. 90033 as it fall in-between 2407 and 2421. Likewise, ELACC has also teamed up with LA conservancy to appose the WW project citing amongst other things historical preservation of garden apartments. But here they are talking about destroying a historic building to replace it with a similar dense mixed use housing. Please go to 2415e. 1st street and look at the building, it is truly a perfect property for historical preservation. The original exterior woodwork, trim, windows, and stained glass have survived 116 years!! Please don’t demolish it restore!!! The building is from 1895 which makes it older than the Boyle Hotel (1889). Why should the Boyle Hotel be save and not this building? They are for all historic purposes exactly the same, they even reside on the same street just 0.7 miles away from each other. BH’s and it’s historical structure have long been abused and demolished for the sake of progress, PLEASE don’t make this beautiful historic Victorian just another victim of progress. ELACC is a developer. Everyone seems to forget this point. They develop projects that will enrich their coffers just like any other developer would do. They suppress market value and have recently began acquiring old buildings. The R church on Beswick and now the buildings on 1st street. I would bet this developer would have loved to raised the Boyle Hotel however, it would have posed a PR problem. But they did change the entire character of edifice with their tired, cheaply constructed box attached to the original building. I know one of their insipid structures a mile away. And they accuse others of poorly conceived development.